A DJ Trunk. It is what we have designed with Louis Vuitton when they offered to build a project together, around travel and music. We like extraordinary projects. This is definitely one of them. The DJ Trunk is the first trunk for DJs with Phantom, the best sound in the world. An ode to music, an alliance between technology and know-how. Quentin Sannié, co-founder of Devialet. Designed for modern-day composers, the DJ Trunk is a reinterpretation of the iconic Stokowski writing-desk trunk, a special order of the famous eponymous conductor in 1930 to transport his work kit. The DJ Trunk was designed to allow DJs to travel with the necessary equipment for their performances: Phantom, turntable and vinyl recordings, mixer, computer and headphones. Handcrafted in Louis Vuitton’s historic workshops in Asnières near Paris, the DJ Trunk puts French know-how in the spotlight. Adorned in Monogram Eclipse canvas (a grey and black Monogram), with ruthenium metal accessories on the outside and dark grey microfiber on the inside. 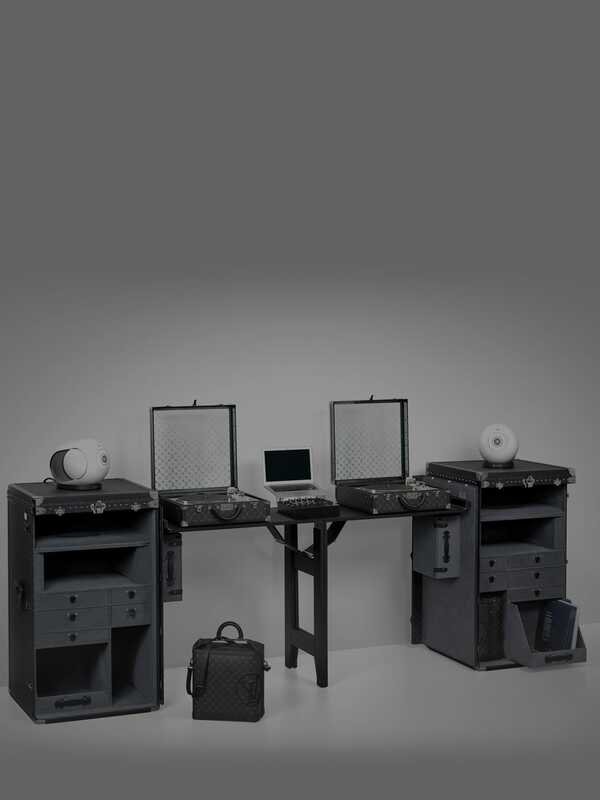 Made up of a folding beech-wood table, covered in black cowhide, the DJ Trunk also contains a custom-made bag in Monogram Eclipse for storing about twenty vinyl, as well as a box to accommodate a turntable. For the DJ Trunk, Devialet has designed an exceptional and limited edition of the Gold Phantom, marked with the logo « LV | Devialet » and whose metal sides with a ruthenium finish are in keeping with the DJ Trunk. The DJ Trunk is on sale as a Special Order. Revealed in Shanghai before travelling the globe as is the long tradition of the Louis Vuitton trunks, it can be used for DJ sets with two trunks or as a listening unit for music and vinyls with one trunk.